The metal beds are not only lightweight; there are many stylish and modern metal beds. If you need a big size bed for your room and less in weight; the metal king beds can be right bed for your room. Apt for traditional bedroom setting, the Abell Sleigh Bed is an excellent choice. Constructed from metal, the bed frame of the elegant Legion bed is sturdy and robust. The powder coated finish in dark bronze with ancient gold highlights adds value and richness to the overall look. Beautifully designed and evenly spaced parallel lines that add appeal to both headboard and footboard. This sleigh bed is made from nontoxic materials and is available in multiple sizes to suit your requirement. Includes headboard, footboard and bed rails. Bed requires box spring (not included). Maximum holding capacity is 750 lbs. Made from cast iron, this gracefully designed Croftshire Sleigh Bed will add elegance with charm to your bedroom setting. The Croftshire Sleigh Bed features unique and stylish cast iron scrollwork with goldstone brushed detailing. This gorgeous bed is a must have. Includes headboard, footboard, set of bed rails and slats. 3 slats provide adequate support to your mattress. Box spring is required (not included with the bed). Available in king size, queen size and full size. Apt for a transitional bedroom décor, the Margaret Panel Bed is an ideal choice. High quality metal construction renders durability, reliability and sturdiness to the bed frame. Charming combination of cherry and silver finish adds appeal to this beautiful bed. The stunning Margaret Panel Bed features a simple yet graceful design based on both vertical and horizontal parallel lines that are repeated evenly. This metal bed is available in three distinct sizes and can support up to maximum 750 lbs. A box spring can be placed atop bed frame and serves as a platform to support mattress. Made from non-toxic materials, this bed is safe for your lovely kids. Product Care: Wipe the bed with a clean damp cloth. Finish: Silver / Cherry Metal. Finished back for perfect look. Headboard, footboard and bed rails included. 2 center support legs comes with king and queen size beds. Slat support system not required. Box spring required but not included. This bed accommodates a king size mattress with king size box spring. Maximum weight capacity is 750 lbs. Other Bottom of Side Rail to Floor: 5"
Traditionally fashioned Arnot Panel Bed is perfectly suitable for a traditional bedroom décor. 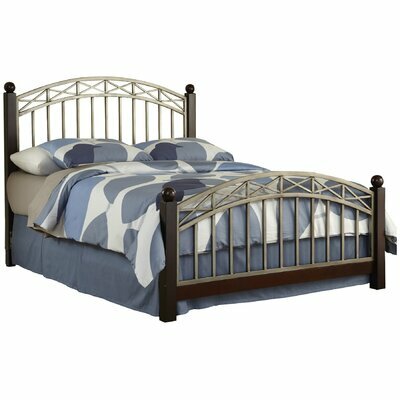 Fully welded metal construction makes this bed sturdy, reliable and long-lasting. 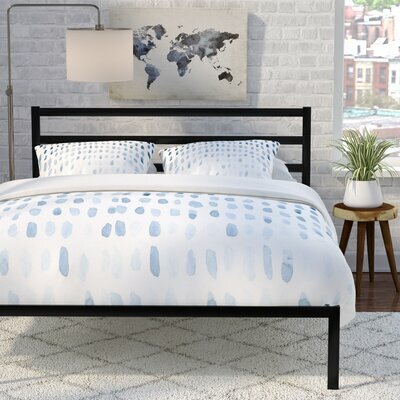 This gorgeous Arnot Panel Bed features a powder coated black finish and heavy gauge tubing with beautifully designed headboard and footboard. The Arnot Panel Bed is non-toxic and can be used in homes with toddlers and pets. Powder coated finish: Black and textured. Box spring is required as mattress platform (not included). Maximum weight capacity is 500 lbs (including mattress). Bring timeless elegance with style to your bedroom with this gorgeous Argent Panel Bed. This appealing bed features an ornate style with intricate curves that will create a stunning focal point in your bedroom. This must is an excellent choice and will form a warm and welcoming sleeping space that you will love coming home to each day. Includes bed frame, headboard and footboard. Does not require slats but requires box spring. Available in queen size, king size and full size. 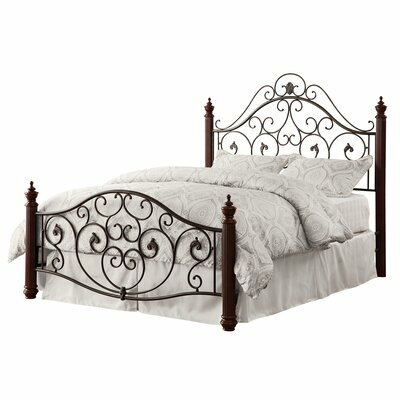 The Regis Bed by Birch Lane is traditionally styled with grill castings and elegant finial posts. The antique bronze Regis Bed exudes charm and elegance with beautifully designed headboard and footboard featuring knots with straight and parallel lines of metal tubing. Bed frame constructed from metal. Back of the bed is finished. Box spring required but not included with the bed. Available in 3 sizes, including king size, queen size and full size. Other Bottom of Side Rail to Floor: 7.5"
Bold and beautiful look of Avey Platform Bed will create a charming focal point in your bedroom. This stunning bed features a matte black finish with clean lines that will bring trendy flair to any bedroom setting. This low profile bed is easy to hop in and out and does not require a box spring. The wooden slat support system ensures optimum support to the mattress with center support legs to keep it stable for a safe and sound sleeping experience. Sturdy wooden slat support system for optimum support. Box spring is not needed. Available in multiple sizes (twin size, king size, queen size and full size). Gracefully fashioned Richardton Panel Bed features a marvelous look with its wooden finial posts and textured black metal headboard and footboard. This attractive bed with the stylish design is fully welded that makes it sturdy and long-lasting. The Richardton Panel Bed is very easy to assemble and available is multiple sizes to suit your requirement. Finish: Black with medium oak. 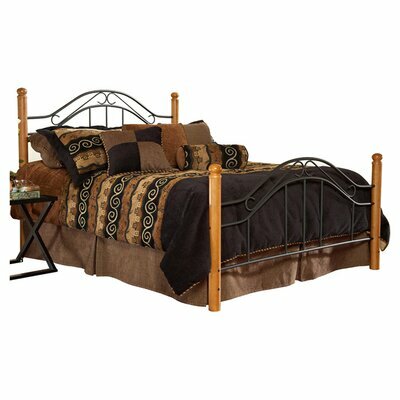 Bed frame includes headboard, footboard and bed rails. Available in twin, king, queen and full size. 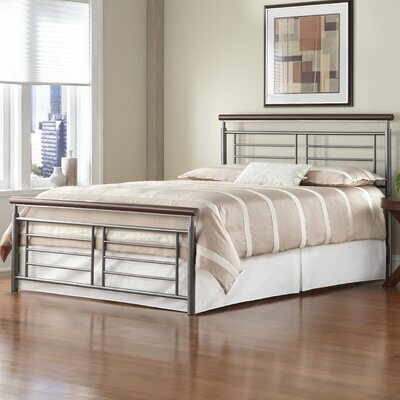 Simply gorgeous, this Bordeaux Metal Bed by Home Styles highlights characteristic transitional design. This slat bed is manufactured from metal with poplar solids and birch veneers for a sturdy bed frame and unique yet beautiful design. The Home Styles Bordeaux Metal Bed features a powder coated espresso finish and arch shaped metallic headboard and footboard with wooden finial posts. This stylish bed comes with 3 slats to adequately support your mattress for a comfortable sleeping experience. Manufactured from poplar solids, birch veneers, and metal. 3 slats included for mattress support. Available in various sizes (twin size, king size, queen size and full size). 30 days warranty for replacement of parts only. The charming and classically royal look of the Wilkes Panel Bed by Three Posts will adorn the elegance of your traditionally styled bedroom décor. This classy Wilkes Panel Bed features a sturdy metal bed frame with ornate and curving lines and rich bronze finish. The classic scroll design of the headboard and footboard adds a romantic feel to this elegantly charming bed. Elegant ornate style with curving lines. Headboard and footboard included with the bed. Maximum weight capacity of king size bed is 800 lbs. The maximum weight capacity of queen size bed is 700 lbs. Maximum weight capacity of full size bed is 600 lbs. Easy assembly with the help of hex key. 1 year limited product warranty.